NORTH ADAMS -- What the Massachusetts Museum of Contemporary Art has done in response to the Christoph Büchel mess is sad, dumb, and shameful. As Globe readers may recall, last year Mass MoCA invited the Swiss sculptor to create a giant installation at the vast former factory complex it occupies in North Adams. On paper, it sounds like it should have been a great match. Büchel has an international reputation for creating ambitious, marvelously complex walk-in environments using all kinds of found materials, and Mass MoCA is known for sponsoring artists with ambitious, big ideas. What went wrong in the fall of 2006 -- when Büchel and his assistants took up residence in North Adams and began working on his project, which was to be called "Training Ground for Democracy," his first major US museum show -- is in dispute. Mass MoCA says Büchel's unreasonable demands pushed the project way over budget, from $160,000 to $300,000. Büchel says Mass MoCA's incompetence and disregard for his expertise caused unnecessary delays and expenditures. In any event, the exhibition did not open as scheduled on Dec. 16, and it remains unfinished. In May, Mass MoCA declared the exhibition canceled and then, paradoxically, said it would sue for the right to open Büchel's unfinished installation to the public as an "open back lot workshop." Büchel has strongly objected to his work being shown in its current state. 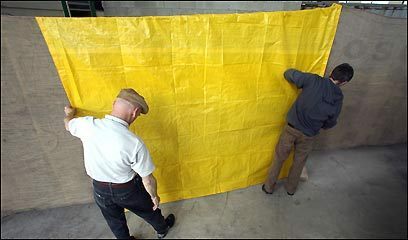 In fact, the installation is now open to the public, but under odd conditions: Yellow tarps affixed to construction fencing block the visitor's view of most of the materials assembled for the project. This is to propound the idea that the museum is not actually exhibiting Büchel's unfinished work and cannot therefore be sued for doing so. If the US District Court in Springfield rules in the museum's favor, then the fencing will be removed. What is at issue is a law called the Visual Artists Rights Act of 1990. Among the stipulations of this law is one saying that the creator of an artwork "shall have the right to prevent the use of his or her name as the author of the work of visual art in the event of a distortion, mutilation, or other modification of the work which would be prejudicial to his or her honor or reputation." This explains why, for the moment, you will find no signs at Mass MoCA announcing Christoph Büchel as the author of the unfinished installation in Building 5. A visitor who has not learned about the show and the controversy beforehand will be mystified by what he or she encounters. As you follow a path between the fencing that leads through the unfinished installation, you can see through openings below the tarps parts of cars, trucks, trailers, storage containers, and other objects close to the ground. And you can see rising above the fence the second story of a white clapboard house, shipping containers stacked 20 or more feet high, cinder-block walls topped by coils of barbed wire, a guard tower, and the upper part of an amusement-park carousel. At one end, there's an almost completely reconstructed interior of an old movie theater. It is altogether a gloomy, frustrating, and not at all illuminating experience. Now I'm not a lawyer, but it does appear to me as an art critic that what Mass MoCA has done certainly misrepresents Büchel's art. Whether or not the exhibition is clearly labeled "unfinished" and whether or not Büchel is identified as its author, many people are going to judge him and his work on the basis of this experience. Indeed, one critic has already gone on record. Writing in Commentary Magazine, Michael J. Lewis observed, "Having inspected it Thursday afternoon, I am not sure that it suffers from being enveiled. On the contrary: just as most naked bodies benefit from clothing, the yellow shrouds hiding most of the exhibit add a note of complexity and mystery to what would otherwise be a rather simplistic exercise in political art." Leaving aside the strictly legal issues, there are larger concerns at stake, which have to do with the relationship between the artist, the museum, and the public. In this regard, Mass MoCA has compounded its wrongs by mounting a slick, disingenuous, egregiously self-serving photo and text display called "Made at Mass MoCA" in a small gallery at one end of the Büchel hall. It tells viewers all about the many successful large-scale projects it has produced with well-known artists such as Tim Hawkinson , Ann Hamilton , and Gregory Crewdson . The implicit message is that Büchel must be a real jerk to have been so uncooperative. "Made at Mass MoCA" also includes a bulletin board adorned with newspaper articles describing the controversy, mainly in terms unfavorable to Büchel. Among them is an editorial from the North Adams Transcript that reads, in part, "Kudos to Mass MoCA for not only taking Swiss artist Christoph (The Great) Büchel to task but also to court for his shameful behavior regarding his long-promised but still not delivered 'Training Ground for Democracy.' "
"Made at Mass MoCA" usefully explains something important about how the museum operates. It prides itself on its ambition not only to exhibit works of art that challenge conventions in terms of scale and media but also to participate with artists in the actual production of large-scale works by providing funding, materials, labor, fabrication expertise, and other kinds of resources. This is different from how art museums traditionally operate, which is to exhibit artworks created at the artist's expense in the studio or in the workshops of professional fabricators. Mass MoCA's approach entails significant risks for the museum. Budgets can be overridden, chemistry between artists and museum personnel can go sour, and a successful end product is not guaranteed. To collaborate with an artist in the production of a large-scale work is a leap of faith. One would hope that a museum thus engaged in artistic collaboration would understand and adapt to what kind of artist it is dealing with in any given project. Some artists are less fussy than others about how their concepts are executed. What may seem to museum workers a perfect solution to a given problem may not necessarily be acceptable to an artist who has an extremely exacting vision of what he is trying to achieve. Anyone familiar with Büchel's past work might guess that he would be one of the fussier, more demanding artists. For example, three years ago, I had occasion to review an installation that Büchel created at the Swiss Institute in New York. A miracle of industry and imagination, it presented to the visitor a grungy, fully-furnished apartment in which, for unexplained reasons, a meandering cinderblock wall divided every room and passageway in half, with crawl spaces allowing entry to some hidden areas. To make your way through this labyrinthine space was to enter an Alice in Wonderland-like world animated by mysteries the visitor could only guess at. What was clear about the installation was that the artist worried over every object in it the way a literary novelist worries over every word and every sentence. Obviously, Mass MoCA's faith in the artist and his process was sorely tested. But does that warrant exacting revenge by turning his project into a show that misrepresents, dishonors, vilifies, and even ridicules him? A show that admits no responsibility for the project's failure on the museum's part and that affirms popular perceptions of our most innovative contemporary artists as frauds and charlatans? Ken Johnson can be reached at kejohnson@globe.com.